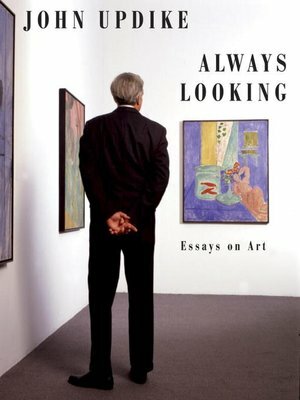 In this posthumous collection of John Updike's art writings, a companion volume to the acclaimed Just Looking (1989) and Still Looking (2005), readers are again treated to "remarkably elegant essays" (Newsday) in which "the psychological concerns of the novelist drive the eye from work to work until a deep understanding of the art emerges" (The New York Times Book Review). Always Looking opens with "The Clarity of Things," the Jefferson Lecture in the Humanities for 2008. Here, in looking closely at individual works by Copley, Homer, Eakins, Norman Rockwell, and others, the author teases out what is characteristically "American" in American art. This talk is followed by fourteen essays, most of them written for The New York Review of Books, on certain highlights in Western art of the last two hundred years: the iconic portraits of Gilbert Stuart and the sublime landscapes of Frederic Edwin Church, the series paintings of Monet and the monotypes of Degas, the richly patterned canvases of Vuillard and the golden extravagances of Klimt, the cryptic triptychs of Beckmann, the personal graffiti of Miró, the verbal-visual puzzles of Magritte, and the monumental Pop of Oldenburg and Lichtenstein. The book ends with a consideration of recent works by a living American master, the steely sculptural environments of Richard Serra. John Updike was a gallery-goer of genius. Always Looking is, like everything else he wrote, an invitation to look, to see, to apprehend the visual world through the eyes of a connoisseur.